#0331-SQL Server-What is evaluated first-TOP or ORDER BY? 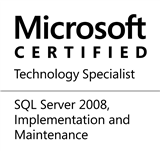 One of our systems needs to support paging and needs to work on multiple SQL Server versions (SQL 2005 and above). Our solution therefore uses the TOP clause and not the OFFSET…FETCH solution introduced in SQL 2012. We need to use both the TOP and the ORDER BY clause. Which will be evaluated first? First up, let us SELECT TOP 5 records from the table without the ORDER BY clause. As can be seen from the result-set, without the ORDER BY clause, no ordering was performed. The records were returned in the physical order in which they were found by the database engine. Now, let us add an ORDER BY clause to the query. First up, we will perform the standard ascending (ASC) ordering. As can be seen from the results, the TOP operation was performed after the ORDER BY, i.e. the results were ordered first, the TOP was performed later. Finally, let us add a clustered index on the table and then fetch the records without an ORDER BY clause. As can be seen from the screenshot above, the results are in a sorted order. The sorting comes from the fact that the database engine used the clustered index to access the table. Because the clustered index arranges records in a logical order, they are accessed in when accessed via the clustered index they are accessed in a specific order. However, SQL Server does not guarantee the order in which the results are returned, so if that’s the requirement, it is always a good idea to use the ORDER BY clause and sort the results explicitly. The TOP clause is evaluated after the ORDER BY/sort operation. If no explicit ordering is performed, SQL Server returns results in the order in which they are physically accessed by the database engine. This entry was posted in #SQLServer, Blog, Imported from BeyondRelational and tagged #SQLServer on April 7, 2014 by nakulvachhrajani.